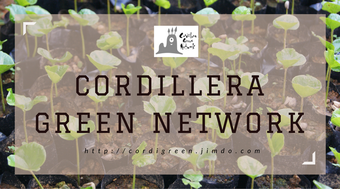 Since 2006, the Cordillera Green Network, Inc. (CGN) has been promoting coffee cultivation through agroforestry method in many communities in the Cordillera mountain region. Here are our main project sites. 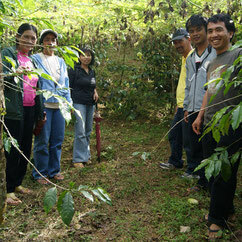 This is the CGN's first coffee agroforestry project conducted in 2003. The project was funded by the Philippine Tropical Forest Conservation Foundation (PTFCF) and AEON Environmental Foundation. 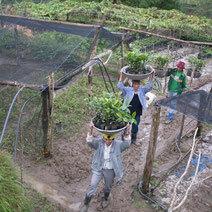 From July 2010 until June 2011, CGN conducted a reforestation project in Kadaclan, incorporating agroforestry coffee production as a partner organization of the Kiyosato Educational Experiment Project (KEEP, Japan). The project was funded by the Green Fund (Japan). The community in Coroz was heavily affected by the typhoon Pepeng in 2009. After CGN carried out an emergency relief program, it extended its support to promote agroforestry coffee production as a counterpart of WE 21 Japan in 2010. It was funded by the Kanagawa People to People Cooperation Fund (Japan). CGN implemented a reforestation project, including coffee cultivation, as a counterpart of KEEP (Japan) in 2014. 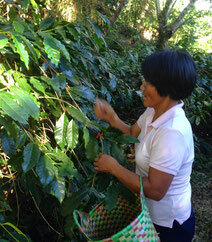 CGN promoted agroforestry coffee production as a part of its reforestation project from 2012 to 2014. This three-year project was funded by AEON Environmental Foundation. CGN has been working with the community in Ambongdolan to implement a three-year reforestation project since 2014. 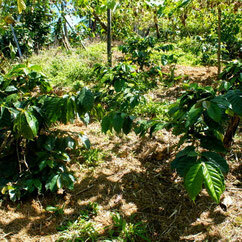 Agroforestry coffee cultivation is an important element in this project. The project will end in March, 2017. It is funded by the AEON Environmental Foundation.